Do you need to send a 30-day letter in my DUI case to appeal the suspension of my driver's license? NOTICE** This letter was formerly referred to a the "10-Day Letter" in Georgia DUI cases. The Georgia law changed on July 1, 2017, with regards to the options and procedures for appealing administrative suspensions and options of drivers accused of DUI in Georgia. If you do not request an appeal hearing (30-day letter) or Ignition Interlock Device Limited Permit: If you do essentially are arrested and "do nothing," your DDS Form 1205 will serve as your driver's license for 45 days. On the 46th day after your arrest, you Georgia driver's license or privilege to drive in the State of Georgia (if you have an out-of-state license) will be suspended for one year. If you refused the requested test, you will not be eligible for any type of limited driving permit. An administrative license suspension permit may be available to you if you submitted to the requested test and have not been subject to an administrative license suspension within the last 5 years. There are also other factors that may affect your ability to obtain an administrative license suspension permit. d) Whether the test or tests were properly administered by an individual possessing a valid permit issued by the Division of Forensic Sciences of the Georgia Bureau of Investigation on an instrument approved by the Division of Forensic Sciences or a test conducted by the Division of Forensic Sciences. **Note: If you request an appeal hearing with a 30-day letter or in person at a Georgia DDS facility, you will have waived your right to an Ignition Interlock Device Limited Permit. See Below. d) you have any other suspension, cancellation, denial, or revocation of your Georgia license. **Note: If you have a Commercial Driver's License, and you request this limited permit, your CDL qualification will be downgraded during the period of your suspension. Our office will send a free 30-day letter for you. There is a $150 fee that the DDS charges to request the hearing but you only have 30 days from the date of your arrest to send the letter. Do not wait until the 45-day temporary permit has expired to send your 30-day letter. If you wait until the temporary permit expires, then it will be too late to request a hearing on the administrative suspension of your license or request an ignition interlock device limited permit. If you are subject to an implied consent suspension (refusing the test), your license may be suspended for one year. Also, if you receive an implied consent suspension, you will not be eligible for a work permit. One of the first questions in any DUI case in Georgia is whether or not you need to submit a 30-day letter. When you are arrested for DUI in the State of Georgia you may potentially have two separate court proceedings in two separate courts. If you refuse to take a state administered chemical test (refusing a blood breath or urine test), then you may be subject to an implied consent license suspension under the Georgia Implied Consent law. This law states that if you refuse the test that the officer is asking for or if you blow over the legal limit (ALS suspension), then you receive a 1-year suspension of your Georgia driver's license or privilege to drive in the State of Georgia. If you have an out-of-state license, then your privileges to drive in the State of Georgia may be suspended and the suspension potentially reported to the State where your license was issued. If so, the issuing state may also institute a suspension of your driver's license. If you have been arrested for a DUI and received a temporary driving permit, then it is highly likely that you need to have a 30-day letter. This temporary driving permit is known as the DDS Form 1205. 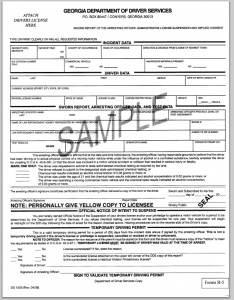 In many but not all DUI cases you will receive a temporary driving permit that serves as your license for 45 days after the date of your arrest. THE MOST IMPORTANT THING TO REMEMBER is that you only have 30 days from the date of your arrest to file for an appeal hearing on the administrative suspension of your license. This is what you are requesting when you send a 30-day letter to the Georgia Department of Driver Services. A common mistake in DUI cases is for a person accused of a DUI to wait for the 45-day temporary driving permit to expire and then contact a DUI lawyer. The 30-day deadline to file for an appeal hearing of this administrative license suspension has passed at that point and you may be subject to a one year license suspension with no limited driving permit to get to work. The Georgia Office of State Administrative Hearings presides over Georgia administrative agencies. One of these administrative agencies is the Georgia Department of Driver's Services. This is the agency that issues driver's licenses in the State of Georgia. This is a completely separate court from the court where your criminal case will proceed. Once you have properly requested your ALS hearing you generally will receive notice of that hearing about one month from the date you sent in your request. These hearings can be very important to your driver's license and your criminal case. The burden of proof at these hearings can be easy for the officer to meet. The officer is required to show that he/she had reasonable grounds to believe that you were operating a motor vehicle while under the influence of alcohol or drugs to the extent that you were less safe to drive. The officer does not have to prove you guilty beyond a reasonable doubt to win this hearing as would be required in the prosecution of your criminal case. Your privileges or ability to drive anywhere in the State of Georgia is at stake at this hearing. You may also be subject to a criminal suspension of your license in the event that you enter a plea of guilty to DUI, enter a plea to a lesser charge which results in your overall points raising to a level that requires a suspension, or being found guilty of DUI by a judge in a bench trial or the jury in a jury trial.